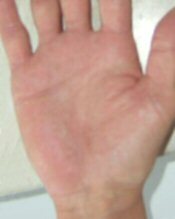 Dermatitis? Your skin needs Derma Shield. Because I spend a lot of time on visiting work places, not only in the UK but as far afield as Australia, I really understand what it's like. I see processes all the time that I know will be causing the people working there to have skin problems like dermatitis. Like you, I also live in the real world and realise that sometimes we don't have the luxury of being able to say to the boss "I can't do that. It will damage my skin". The reality is that often you will be under pressure just to get the job done and told to "stop moaning". It doesn't matter whether you work in a factory, bank, building site, post office, dentist, fire station, vets, printer or hospital you will all have the potential for dermatitis. It could be oils, greases, coins, papers, skin sanitiser, inks, coolants or just working outdoors in all weather. Your skin can become very dry, flaky, itchy, red or splitting across the finger tip or knuckles. I know how painful this dermatitis is yet you still have to go to work. Users constantly tell me how their quality of life has greatly improved since using Derma Shield. It has relieved the pain and constant suffering that they endure and they are no longer embarrassed and self conscious about their dermatitis damaged skin. Derma shield will sink into your skin and release nutrients, which will help to nurture and protect your skin, retaining moisture and suppleness, and alleviating dry cracked, chapped, sore skin that are typical symptoms of dermatitis. I will help you cure your painful and embarrassing dermatitis! Dermatitis cured by Derma Shield. 5 pence a day. Guaranteed, or a full refund. Once applied Derma Shield will stay on your skin for 4 to 5 hours despite repeated washing. You don’t have to worry about removing it, as it will come off as your skin naturally sheds. I fully appreciate, not only the physical aspects of having a condition such as dermatitis, but also the emotional impact the condition has on you and your family. That is why I manufacture Derma Shield. I passionately believe that dermatitis sufferers deserve the best treatment and care possible at affordable prices. Users constantly tell me that their quality of life has greatly improved since using Derma Shield. It has relieved the pain and constant suffering that they endure, and they are no longer embarrassed and self conscious about their dermatitis damaged skin. Thousands of people can't all be wrong. Try Derma Shield for yourself and you will quickly see an improvement in your skin dermatitis. And remember it comes with a 90 day, no quibble, money back guarantee! We have been using Derma Shield in our manufacturing plant for almost 12 months now and it has to be said that it is a resounding success. From the first time it was trialled the users were praising of the immediate moisturising properties of the product. What has cemented the widespread use of Derma Shield is the number of people who have witnessed their pre-existing skin problems improve with the daily use. Many of them have had creams from a doctor which have failed so they are really impressed with your product. From my perspective, it is great not to have to police the use of a safety procedure, I just know it will be used. Derma Shield moisturises, nurtures and protects your skin from skin problems like dermatitis. One application will last up to 5 hours despite repeated washing! More? How does Derma Shield work? Derma Shield is dispensed as a light mousse that quickly sinks into your skin. As it does so, pharmaceutical grade moisturisers such as Aloe Vera and vitamin E are absorbed. Then Derma Shield forms a breathable and waterproof shield over your skin to stop dermatitis. More? How safe is Derma Shield? We manufacture Derma Shield under pharmaceutical conditions using only the finest ingredients that are chosen for both their effectiveness in dealing with skin conditions such as dermatitis and their gentle action on your skin. More? Do you know someone who may be interested in this site?